Christopher Lloyd is going to rip you limb from limb for stealing his fizzy lifting drink. Because in this Willy Wonka and the Chocolate Factory horror retelling, Gobstopper, you're his secret ingredient. Sorry to disappoint, but this is a just an internet spoof of the original Wonka movie. 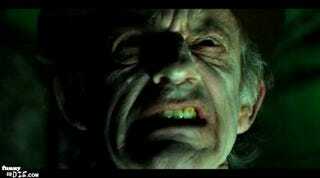 Still, getting Christopher Lloyd is a stroke of pure genius. It's pretty hilarious, and I hope someone in Hollywood forks over a fat pile of cash to the writers of this faux horror movie, because it's better than most actual horror-comedies I've seen. Funny of Die, you have outdone yourself.